The four are: Aimé Kilolo-Musamba, Bemba’s lead defense counsel; Jean-Jaques Mangenda Kabongo, also part of Bemba’s defense team; Fidèle Babala Wandu, a member of the DRC parliament and deputy secretary general of Bemba’s Movement for the Liberation of Congo; and Narcisse Arido, a defense witness in the case. 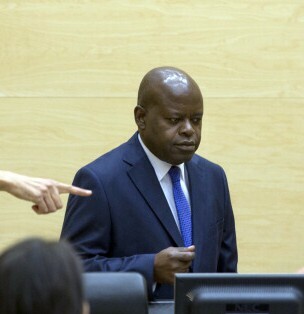 According to the ICC, Kilolo Musamba was released in Belgium, Babala Wandu in the DRC and Narcisse Arido in France. Mangenda Kabongo will released as soon as the ICC Registry finalizes all the necessary arrangements. The prosecutor alleges that since early 2012, a criminal scheme took place in which certain defense witnesses in the Bemba trial of were given money and instructions to provide evidence and testimony to the Court that they know to be false or forged. Bemba is the fifth suspect in the case, and will remain in ICC custody. His trial for alleged crimes against humanity and war crimes committed by troops under his control in the Central African Republic in 2002-3 opened in November 2010. See our CAR webpage for more information. Read more about the importance of ICC member states hosting detainees on interim release. A prosecution witness recalled by judges in the Bemba case will testify in closed session. Judges warned the Kenyan government against public leaks of information related to the case against President Uhuru Kenyatta’s, specifically referencing the leaking of a request to freeze or seize Kenyatta’s assets. They subsequently ordered the Registry to make public documents related to the request. The American NGO Coalition for the ICC discussed the options available to ICC judges following the status conferences in the case against Kenyatta. A group of Kenyan civil society activists denied that they called for Kenya to be sanctioned over the ICC cases. Members of Kenyatta’s Jubilee coalition vowed to launch a new effort to withdraw from the ICC and say that they will ask the ICC Assembly of States Parties to intervene and have the Kenya cases dismissed. A group of MPs, believing that the ICC is colluding with Kenyan civil society, want to pass a law requiring NGOs to divulge the sources of their funding. Raila Odinga said that the charges against Kenyatta should be dropped if there is insufficient evidence to proceed. During his visit to Egypt, rights groups from Sudan and Egypt issued statements reminding that Sudanese President Omar Al-Bashir is wanted by the ICC. An Egyptian official said that there was no problem with Al-Bashir visiting because Egypt is not a member of the ICC. Al-Bashir was chosen by his party as its candidate for the 2015 elections. The Sudanese air force reportedly bombed villages in North Darfur. The ICC Appeals Chamber heard arguments in the trial of former militia leader Mathieu Ngudjolo Chui, with Ngudjolo claiming that he is a victim and insisting on his innocence. Judges ordered the ICC Registry to provide more funds to Bosco Ntaganda’s defense team. The UN Mission in the DRC stepped up security after attacks on its bases in North Kivu. Pressure is increasing on UN peacekeepers and regional powers to eliminate the FDLR rebels as the group defies an ultimatum to disarm. The UN high commissioner for human rights condemned the Congolese government for expelling his top envoy in the DRC. A new report from the International Center for Transitional Justice provides insights on how women have been affected by the conflict in northern Uganda and how plans for transitional justice can be responsive to their needs. Libya’s National Commission for Human Rights called for the country’s grand mufti to be tried by the ICC for inciting murder torture and other offenses. A Tripoli-based journalist speculated that Libya could descend into civil war. The UN urged the Malian government to show a strong signal of its commitment to peace before the restart of negotiations with rebels. This week, the trial of former first lady Simone Gbagbo and 82 other individuals associated with former president Laurent Gbagbo was postponed this week. The accused face charges related to undermining state security. The International Federation for Human Rights (FIDH) called the trials an important milestone in the judicial process related to Côte d’Ivoire’s 2010 post-election violence, but emphasized that the most serious human rights abuses must also be prosecuted. The group said that this first trial of Simone Gbagbo—which does not involve charges of crimes against humanity and other international crimes—is a test for the Ivorian justice system. FIDH, along with Ivorian rights groups LIDHO and MIDH, also noted that Simone Gbagbo is wanted by the ICC for alleged crimes against humanity and should be transferred to the Court if Ivorian authorities are unable or unwilling to prosecute her on those charges. The Côte d’Ivoire Coalition for the ICC called for the Ivorian government to commit to justice for both sides of the 2010 post-election violence and to ensure that all trials are fair (in French). Ivoire Justice interviewed Charles Blé Goudé’s lawyer, who argued that the prosecution’s case against his client is weak (in French). Germany gave Colombia $100 million for post-conflict reconstruction, including reparations (in Spanish). Georgia’s parliament condemned a proposed treaty between Abkhazia and Russia as an attempt to annex the breakaway Georgian territory. Russia called Georgia’s comments dangerous speculation. At least 30 people were killed in clashes between the Nigerian military and the Boko Haram in northeast Nigeria despite a recent truce, and reportedly abducted dozens of women and girls. Despite the violence, the Nigerian government said that the return of the over 200 girls abducted by the group is “inching closer.” A US-based Nigerian group wants the ICC to investigate alleged government sponsors of the Boko Haram. Human Rights Watch (HRW) condemned the use of cluster munitions in Ukraine. Amnesty International (AI) found evidence of summary killings in eastern Ukraine. AI expects the next Ukrainian parliament to ratify the ICC Rome Statute. Parliamentarians for Global Action organized meetings between ICC officials and a delegation from the Kurdistan Regional Government. The UN assistant secretary general for human rights said that Iraq should join the ICC. In a Huffington Post op-ed, a Scottish MP argued that the United Kingdom shouldn’t try to stop Palestine from joining the ICC. FIDH, REDRESS, TRIAL and the European Center for Constitutional and Human Rights published a report on access to justice for victims of serious international crimes in the EU. HRW called on Chad to try two alleged accomplices of Hissène Habré that it has refused to transfer to Senegal’s special court. North Korea has reportedly started a diplomatic charm offensive to avoid an ICC referral, but a North Korean diplomat warned that any effort to bring North Korea’s leadership to the ICC would result in unspecified countermeasures. China expressed its opposition to a referral. An Australian MP asked the ICC to investigate the Australian government’s alleged crimes against asylum seekers.